The famous Heckler & Koch G3 battle rifle really wasn't a new or innovative design when it was adopted by the West German Army in the late 1950s. In fact its roots can be traced back to the STG-45(M) prototype developed by Abteilung 37 at Oberndorf am Neckar (aka the special weapons development group at Mauser). The STG-45(M) never went into general production and only a few completed parts sets were even ever made, but it did pioneer the roller delayed blowback recoil system without the usage of a gas system. After the war, the design prints and even the designers themselves of the STG-45(M), went in two directions. Ludwig Vorgrimler took the blueprints to Spain and teamed up with Cetme. Some other German engineers from Mauser were convinced to relocate to France and put their expertise to work at the Ceam small arms factory. French efforts to develop a roller delayed blowback carbine resulted in the CEAM Modèle 1950, which never went into production due to budgetary cutbacks. Cetme in Spain however, took the design and ran with it. The Cetme Model 02 was chambered for a proprietary 7.92x40mm intermediate cartridge. It was a roller-delayed blowback full-sized rifle without a gas system of any kind. The Model 02 drew the attention of the West German Bundesgrenzschutz, but they wanted it capable of handling a standard full power NATO cartridge. So next came the Cetme Model A, chambered for 7.62x51mm. Unfortunately, the Model A could only safely handle a reduced power version of the cartridge and in 1956, the West German Bundesgrenzschutz lost patience with the development of the design and adopted the FN FAL as the G1 instead. Cetme however, did not give up on the system and teamed up with Heckler&Koch to develop the Model B. The Model B still fired the reduced power 7.62mm Cetme round, but had an improved metal handguard, and could fire 22mm standard rifle grenades. It was officially adopted by the Spanish military in 1958, as the Modello-58. 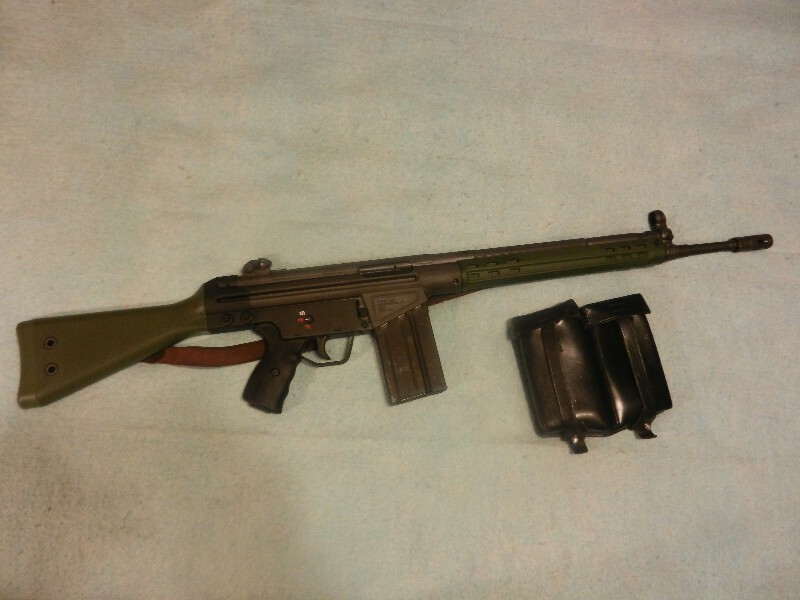 Further refinement of the design continued and a year later, the West German Bundeswehr officially adopted a modified version of the Cetme Model B as the G3. The G3 differed from the Model B in several smaller ways such as sights, furniture, and bayonet mounting style; however, the most important difference was the fact the G3 could safely fire the standard 7.62mm NATO full power cartridge. It should be noted that the Modello-58 could also fire 7.62mm NATO if an improved bolt group and recoil system were installed. Later, the Spanish military would adopt a version of the Cetme intended exclusively for the NATO round. Two manufacturers were contracted with by the West German government for G3 production: Rheinmetall and H&K. Rheinmetall produced rifles until 1969 and in 1977, H&K negotiated with the government for full rights to the production line. The original G3 battle rifle had a wooden buttstock and either a metal or wooden handguard. It also had a straight style of cocking tube and a different pattern of sights. The G3A1 was the same rifle, but with a 2 position metal collapsing buttstock. It was the G3A2 which introduced the now famous HK style of diopter sights and the tapered cocking tube. Originally, G3s were issued with 20 round steel box magazines. The G3A3 became the most common version in West German service and had a polymer buttstock and handguard with steel heat shield. The G3A4 was the same as the A3, but with a 2 position metal collapsing buttstock. The A4 was also offered in a carbine version with a 13" barrel, known as the G3KA4. Around 1964, H&K attempted to develop a disposable 20 round plastic magazine for the G3, but instead the now very common aluminum 20 round magazine was adopted. The aluminum magazine was easier to manufacture than a plastic one and was just as lightweight. Most G3s issued from the late 1960s onward had these magazines, though the older steel box magazines continued to be manufactured and used. The G3 design was adopted into over 50 militaries around the world and licensed produced in nearly a dozen factories. I am not going to type out all of the makers of the series, but i will say it was used in Sweden as the AK4 and in Norway as the AG3. 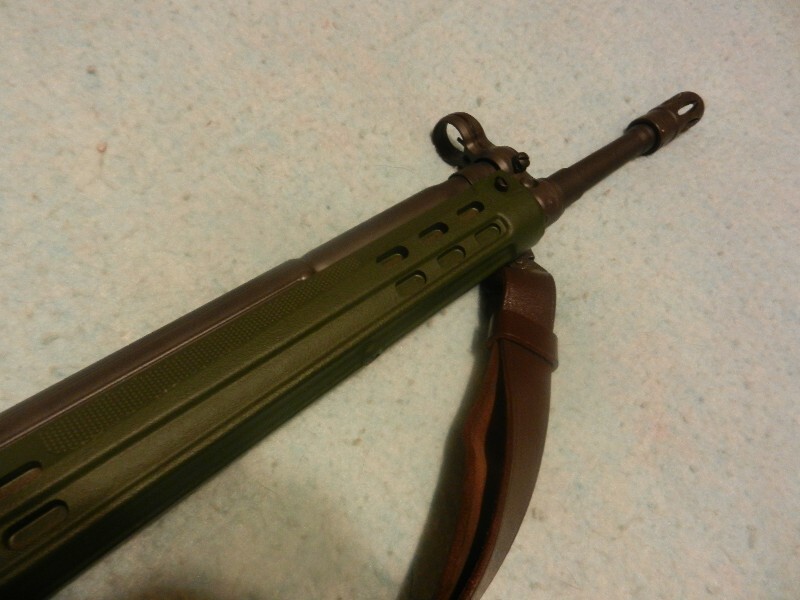 These Scandinavian versions had a few minor upgrades including a finger sized serrated spot on the bolt carrier for manual closure like a forward assist, a slightly longer buttstock, and an all metal cocking handle. Most militaries retired the G3 in the late '90s or early 2000s. Naturally many can still be found in South America, Asia, and Africa, especially in the hands of paramilitary forces. Click here to view Wikipedia's list of users. The G3 was also made by H&K as a semi-auto only rifle starting in 1962. Early semis were still marked G3 and had paddle mag releases and lower frames held in place by a push-pin. In 1964, the HK41 was introduced as the semi-auto version of the G3. Until 1974, the HK41 was produced with the same paddle mag release and push pin lower. A few did make it into the USA before the 1968 Firearms Act, but HK41s imported in 1974, lacked these military style features as well as grenade rings and usually did not have bayonet lugs. IN 1975, the series was renamed to HK91, but remained basically the same except for changes in the markings. In 1989, military style rifles were banned by an executive order signed by President Bush, and the HK91 was prohibited by name. A few rifles caught in transit were quickly renamed HK911. These rifles had a thumbhole stock instead of a pistol grip and military stock arrangement. They also had their flash hiders removed and muzzle nuts welded over the barrel threads. These modifications were done to make the rifles 'sporting' under the new restrictions. Finally, in the early '90s, a more permanent and sporting replacement for the HK91 was introduced by H&K the SR9. The SR9 was actually a series and featured a PSG-1 profile barrel, thumbhole buttstock, non-threaded barrel, and a handguard not capable of accepting a bipod. Even the SR9 was prohibited from importation in 1997, when it was declared still too evil because it could accept standard high capacity G3 magazines. I think after all this and because they were closing out the production line anyway, H&K just gave up on trying to export guns for US civilian consumers. Springfield Armory also imported an HK91 clone under the SAR-3 designation. The SAR-3 was produced by Hellenic Defense Systems in Greece and was very similar to the original H&K rifle. The SAR-3 was also banned from importation in 1989, so Springfield responded with the sAR-8. This version, like the HK911, had a thumbhole stock and non-threaded barrel. SAR-8 importation ended in 1994, though Springfield did domestically produce more rifles named SAR-8 in the late '90s. These were built using US made cast receivers and surplus or unissued G3/91 parts sets. Century Arms International has produced both Cetme and G3 Sporter clones since the late '90s, using military surplus parts sets and US manufactured receivers. Some use original barrels while others have US made ones. These can vary wildly in terms of quality and fit and finish. The Cetme Sporter is still in production, but it seems the G3 Sporter is not. IN 2001, JLD Enterprises in the USA purchased tooling to manufacture the G3/HK91 from FMP in Portugal. Originally, JLD manufactured the PTR-91F as a target rifle version of the HK91 with a heavier barrel and .308 spec. chamber, but more recently, the PTR-91GI has been introduced. The PTR91GI is more like an original G3A3 with a thinner lighter barrel, and 7.62mm NATO spec. chamber. It is finished in a military style dark grey parkerization and ships with original G3 furniture. My rifle is a GI model. Originally it came with the standard PTR91 polymer lower, but I have installed a parkerized steel G3 lower that was clipped and pinned for a more original look. 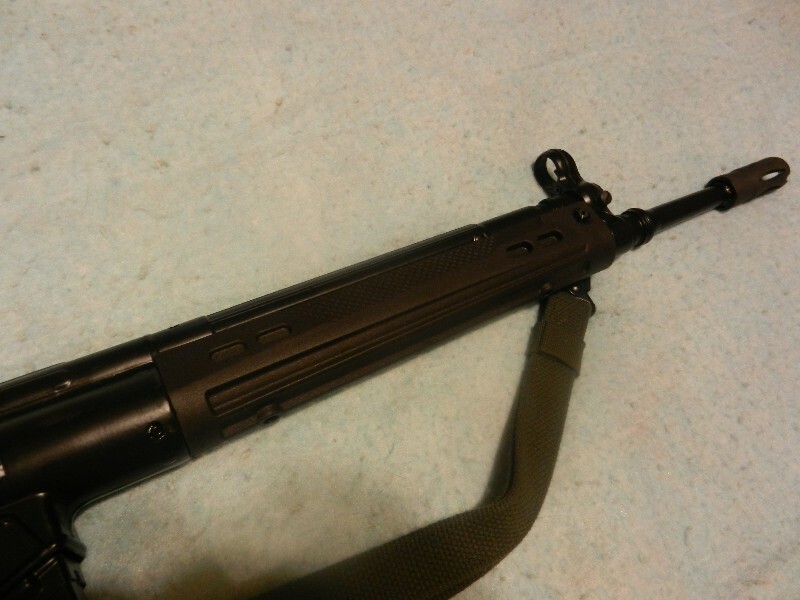 I also added a bayonet lug and mine has an original HK flash hider, which is good as the US made hiders that PTR uses are just a hair too wide to let a bayonet easily slip over them. Mine also shipped with an original HK trigger group and recoil spring guide. I am very happy with it and its been 100% reliable except for the very first round of Tula I tried firing. I think it was due to me not having removed enough grease from the bolt group. Since that one thing, no problems at all though. I am very happy with it the way it is, though i might have a paddle mag release installed eventually. It is pictured with an original steel H&K mag in it along with a military leather 2 cell pouch and surplus leather sling. For a long time i wanted a close copy of the G3A3. The Century guns were quite close to original as they were built with original demilled G3 parts, but their quality just wasn't as high as I'd have liked. The PTR91Fs on the other hand had the quality I was looking for, but were too much of a target rifle for my tastes. So when the GI was released, it was perfect for my wants. 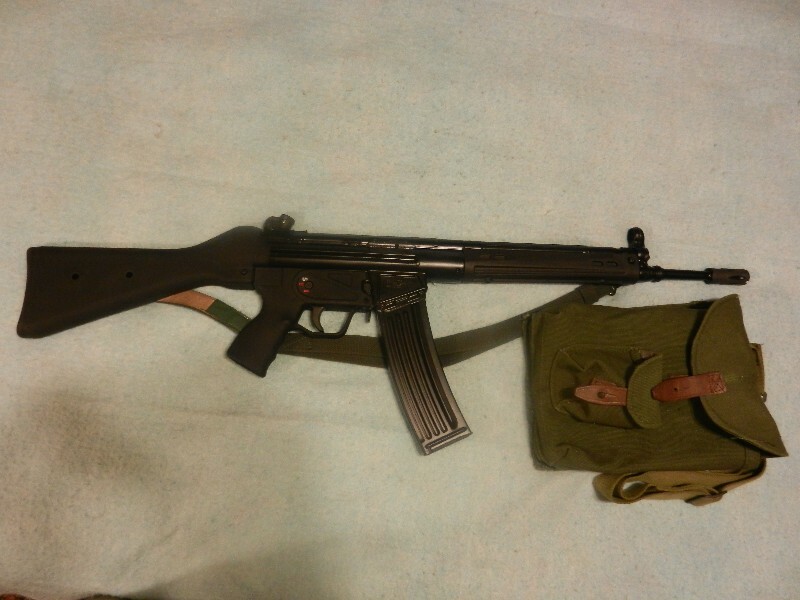 Also, a price tag of $850 new wasn't at all shabby considering new Cetme Sporters from CAI are about $600 these days if you can even find one for sale. My PTR91GI looks very nice next to my East German MPI-KM (AKM clone produced in the DDR) as together one can really compare what each German state was using during the Cold War. After the initial success of the G3 battle rifle, H&K decided to use the same operating principles and layout to create an entire family of rifles and carbines. Starting in 1964, the HK32 and HK33 went into development. The HK32 was of similar dimensions as the HK33, but chambered for the 7.62x39mm M43 Soviet cartridge. It was targeted at nations that were not allied with the Warsaw Pact such as Finland, but due to their close proximity to such nations did use the same 7.62x39 round. The HK32 never took off and only a few prototypes were ever built by H&K. Its sister design however, the HK33 did find respectable success. The 33 was chambered for the then very new .223 Remington round just starting to see some use by American forces in Vietnam. The 33 wasn't really meant to replace the G3 in West German service. It was targeted for export and special forces contracts rather. The Hk33 used the same roller-delayed blowback system as the G3, but was scaled down for the smaller cartridge. It had a shorter 15.3" barrel, forearm, and cocking tube, but still retained the G3's general profile. From the outset, the 33 was offered with either 25 round steel or 40 round aluminum magazines. The latter magazines gave the rifle a distinct advantage over the Colt M16 with its 20 round magazines. Development and trials continued with the platform, until it was officially released for commercial sales in 1968. Originally, the Hk33 had a barrel with a 1in12 twist rate for stabilizing the 55g .223 projectile, but in 1982 it was given the faster 1in7 rate for the new 62g 5.56mm NATO round. Another major change occurred in 1980, when the recoil buffer system was moved from the bolt carrier to the end-cap of the buttstock. A few other changes happened during the '70s including adding a finger sized serration to the bolt carrier as a manual closure forward assist, offering a wide 'tropical' forearm capable of supporting a quick detach bipod, and strengthening the buttstock. Usually a rifle with all of the modernizations is generically referred to as an HK33e. All in all though, the design did not really change all that much during its production run at H&K. The design came in several versions. The HK33A2 was the standard rifle with fixed buttstock and the HK33A3 was the same, but with a collapsible two position metal stock. What about the plain HK33 and HK33A1 though? I suspect these were older versions with fixed or collapsing stocks. Its possible the HK33 differed from the HK33A2 by having a steel lower, only offered with a slim handguard, and the early buffer system; but I can not find any evidence of this designation being used to refer to such a model. Perhaps it was dropped before serial production began? It just makes since based on how H&K has organized their naming system with their other rifles. At any rate back to variants. As with the G3, a carbine version was also offered with a shorter 12.3" barrel and collapsing stock designated as the HK33KA3. 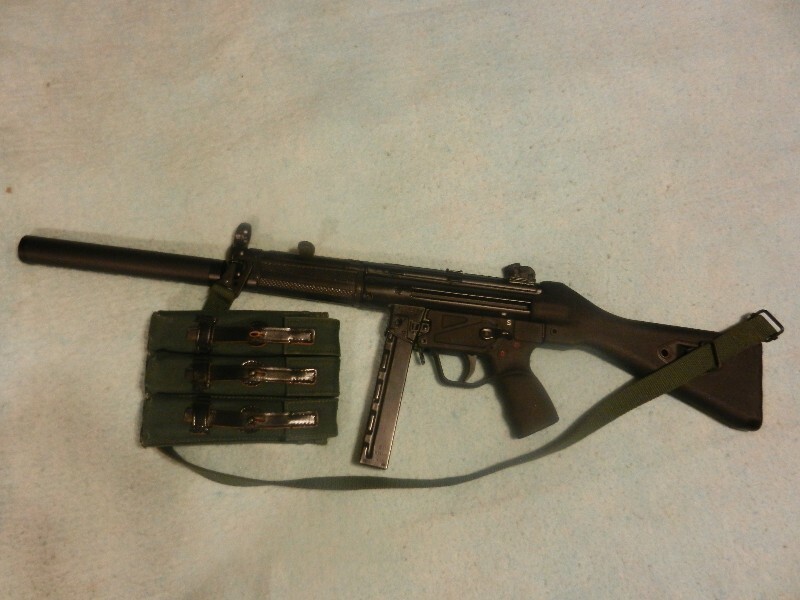 An LMG version was marketed as the HK13 with a quick detach barrel and drum magazines too, but by far the most successful member of the family was the HK53. Looking around it actually seems like the 53 might have seen even more use than the basic HK33. The HK53 was a submachinegun sized version with a 8.5" barrel, short MP5 type handguard, and most later versions came with an open-ended 4 prong flash hider. Most all of the HK53s in service had the classic H&K collapsing buttstock. Its really no wonder the design was popular as it gave users a very compact and easy to handle firearm that nevertheless still fired a powerful rifle cartridge. An interesting footnote in this rifle's history is the T223 prototype marketed by H&R of the United States in 1965-1966. The T223 was built from imported H&K parts by H&R and was very similar to the standard HK33, but also featured a last-round bolt hold open device. Special 25 round T223 magazines were manufactured to work with the BHO. The rifle could use standard HK33 magazines, but the bolt would not remain back on an empty magazine. About 50 such prototypes were shipped over to Vietnam for Navy SEALs to try out. Obviously, the design never took off and there is very little information on the T223 today. It had a slim handguard and was issued with original German 40 round magazines, as well as the US produced 25 rounders. 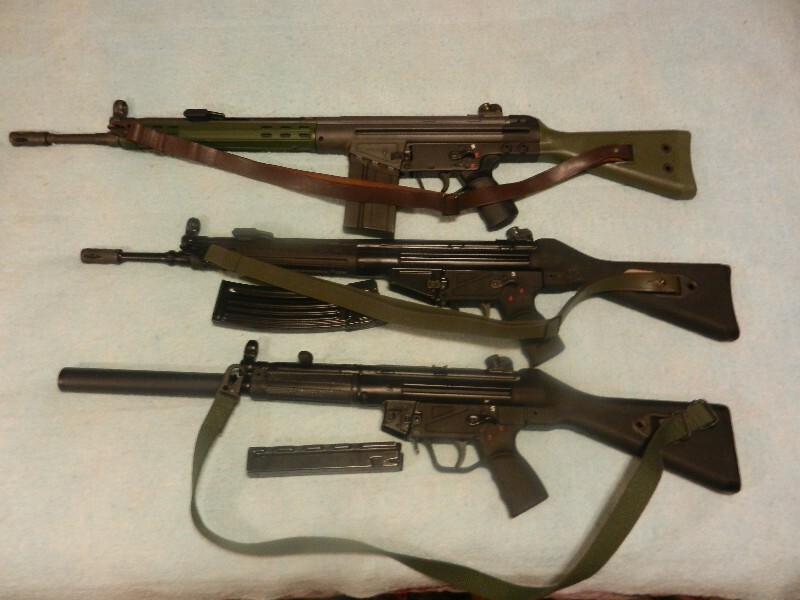 The HK33 did not obtain the same success as the G3 and MP5, but nevertheless several militaries and police departments did adopt some member of the family. It was manufactured under license in both Turkey and Thailand for their militaries. Malaysia also adopted the HK33, but did not actually manufacture the parts. Instead, virgin parts were shipped from Germany and final assembly occurred in Malaysia. The reason it seems that some are under the false impression that Malaysia manufactured licensed clones of the rifle domestically is because often "Malaysia and Thailand' are mentioned together in the same passage and it is true that Thailand has made complete T11 clones of the HK33 domestically. Click here for Wikipedia's list of users. As with the G3, H&K also marketed a semi-auto version of the HK33. The HK43 was sold in the USA in 1974 and was built with an original 15.3" 33 barrel and had a permanently attached flash hider. It did not have a grenade ring or bayonet lug, just like the late HK41s. A new 30 round steel magazine was created for and sold with the HK43. In 1975, H&K also rebranded the semi-auto .223 as the HK93. The 93 also was manufactured with a 16.25" civilian barrel and had a removable flash hider. It too shipped with 30 round magazines. It seems that most of the 93s imported had barrels with a 1in12 twist rate and only rifles brought in in the late '80s had the 1in7 twist rate. It was banned from further importation by name in 1989. 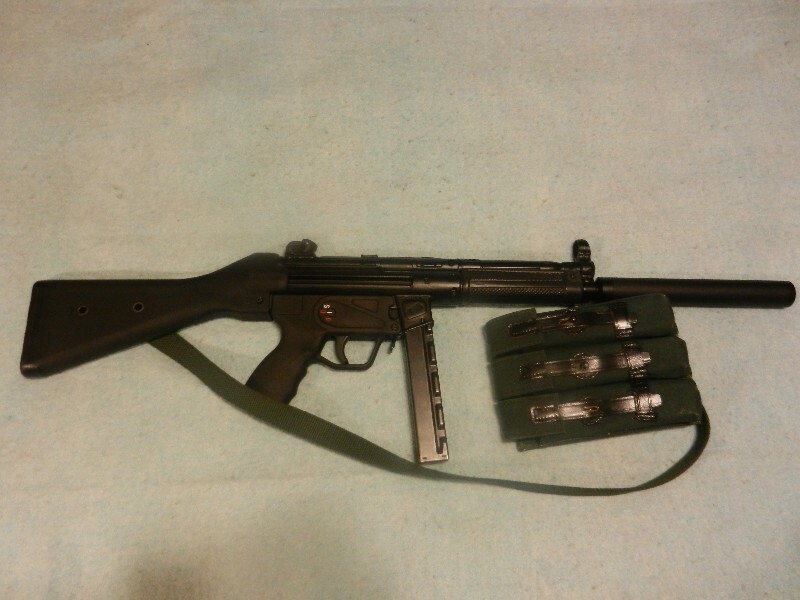 Not nearly as many manufacturers have built semi-auto, civilian legal clones of the HK33. Special Weapons did make some, though I know little about them and have not personally fired one. I am sure they are about like Todd Bailey's other offerings. More recently, with the availability of thousands of surplus HK33 parts kits from Malaysia, Century Arms has been producing the C93 Sporter. The C93 is built from original military parts on a newly made US receiver and with a new 16.25" long barrel. The rifle does have most of the military features, many of which were not offered on the original HK93, such as a grenade ring on the barrel and bayonet lug. It also features a flash hider, wide tropical handguard, folding carry handle, and a rather ugly US made grip frame. The C93 is of decent quality, especially when one factors in its low cost and the fact it uses many original H&K manufactured parts. It does not have a paddle magazine release and comes with either a black or grey parkerized finish. Just this year, Century has also introduced a semi-auto version of the HK53 as the C93 Pistol. The pistol has an 8.5" long barrel, shortened cocking tube, and MP5 type wide handguard. It is also built from surplus original H&K parts and as it is a pistol, it uses an original grip frame. It has an end-cap with sling swivel instead of a stock. These are honestly too new to know how well they will be accepted by the market, but initial reception has been mostly positive. Many of the US parts are manufactured by RCM, which is a good thing. Vector Arms in Utah has been producing a semi-auto clone of the HK93 using surplus parts for several years now. It is named the V93 and is built with a receiver flat imported from Turkey. It uses an original 15.3" long HK33 barrel and has its flash hider permanently attached to the barrel to give it a legal overall length. 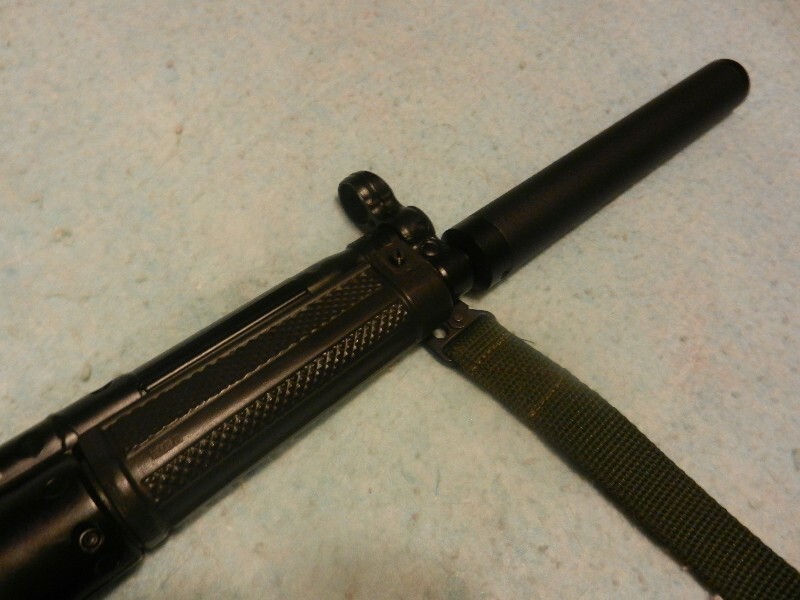 The V93 has a bayonet lug, grenade ring, and does have a paddle type magazine release. It also uses an original military grip frame, converted to semi-only. All V93s ship with the wide tropical handguard and come with either an a2 fixed stock or an A3 metal collapsing stock. They have a powder coat baked on finish rather than parkerization. Here is my V93 with the A2 stock as that's what I prefer. I added a slim HK33 handguard to it from RTG and i really like the results. 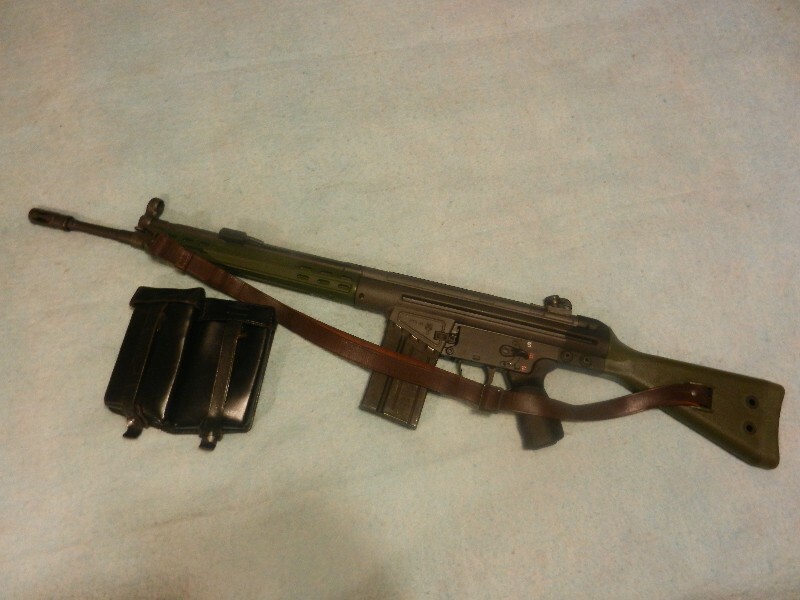 It is pictured with an original 2 pocket HK33 40 round magazine pouch and also with a com-block 4 pocket RPK pouch. The RPK pouch holds the taller aluminum 40 rounders very well. A sling made by POF I believe is on the rifle. I can't say how reliable it is as I have not fired it yet. That said, I've sold many of these and no one has complained yet to me about functional problems. Vector also makes a clone of the HK53, as the V53 pistol. It is very similar to the Century C93 Pistol, but has the powder coat finish and paddle style magazine release. I believe the V53 is built with a US made barrel from RCM too. 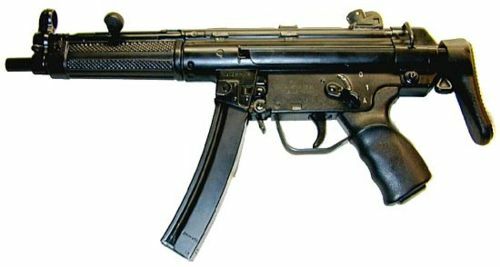 The MP5 began its life at nearly the same time as the HK32 and HK33 in 1964 as part of H&K's desire to have an entire family of weapons based on the roller delayed system. 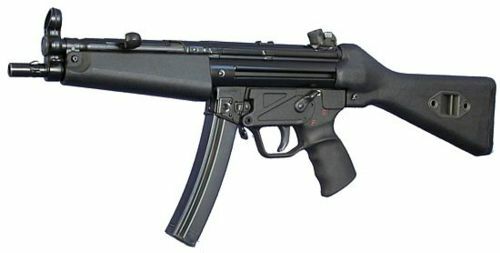 Originally the MP5 was designated by the company as the HK54. Primary development was conducted in 1965. The HK54 fired the standard 9x19mm NATO cartridge, derived from the earlier 9x19mm Parabellum round. It was an SMG sized weapon with an 8.5" barrel, short handguard, and polymer buttstock. After adapting the roller system to handle the full power 7.62x51mm and the intermediate .223 round, scaling the system to work with 9mm was an easy challenge to overcome. By 1966, the HK54 was ready for full-scale production and it immediately took off. Within the first year it was adopted by the West German Federal Police, border guard, and army special forces. It was at this time it received its iconic designation of Maschinenpistole 5. 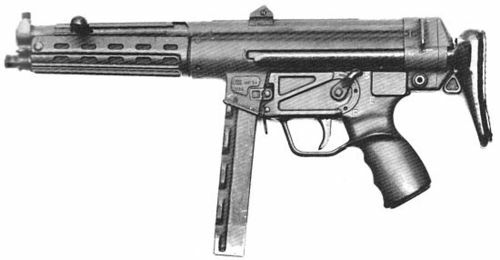 The MP5 replaced some older Israeli made Uzis, designated in West German service as MP2s, but it should be noted that the West German Army continued to use the Uzi and never adopted the MP5. Original SMGs from the '60s were slightly different from later ones. Most notably, they had slim handguards instead of the more recognizable wide 'tropical' ones later offered by H&K. They also used different sights with a blade type front and flip notch type rear. The barrel had a 2 slot compensator on the end. The original magazines were straight with finger grooves and held 30 rounds. In 1977, the 30 round arch or curved magazine was introduced along with a new shorter 15 round version for special purpose applications. I am not really going to say much on the MP5 as there are entire websites online dedicated to it and you might know a lot more than me about it anyway. Honestly, of the three H&K designs discussed in this thread, the MP5 excites me the least. Though i do admit i like shooting them. 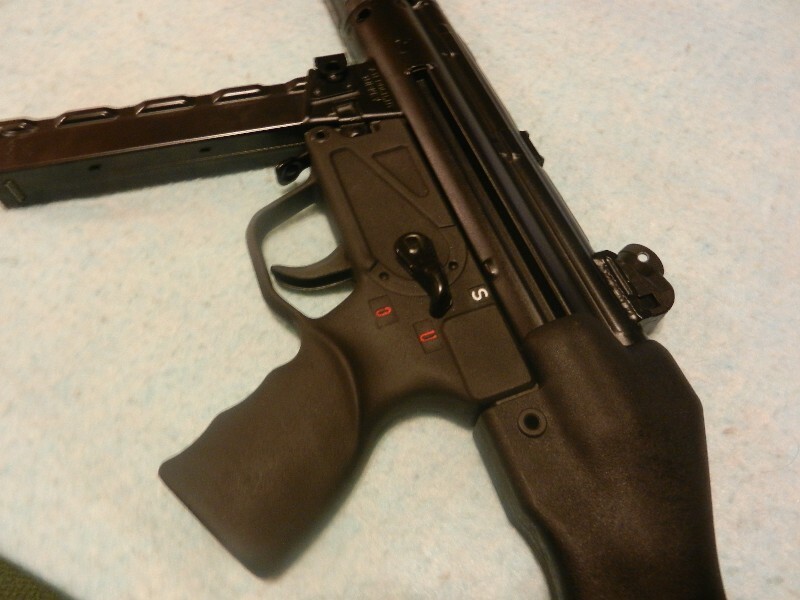 The MP5 designation refers to the original configuration with fixed buttstock and metal trigger housing. MP5A1 is the same weapon but with a 2 position collapsable stock. MP5A2 is the modernized version with current drum diopter rear sights, protected front post, polymer lower housing, wide handguards, 3 lug adapter for a suppressor on the end of the barrel, and with a fixed polymer buttstock. 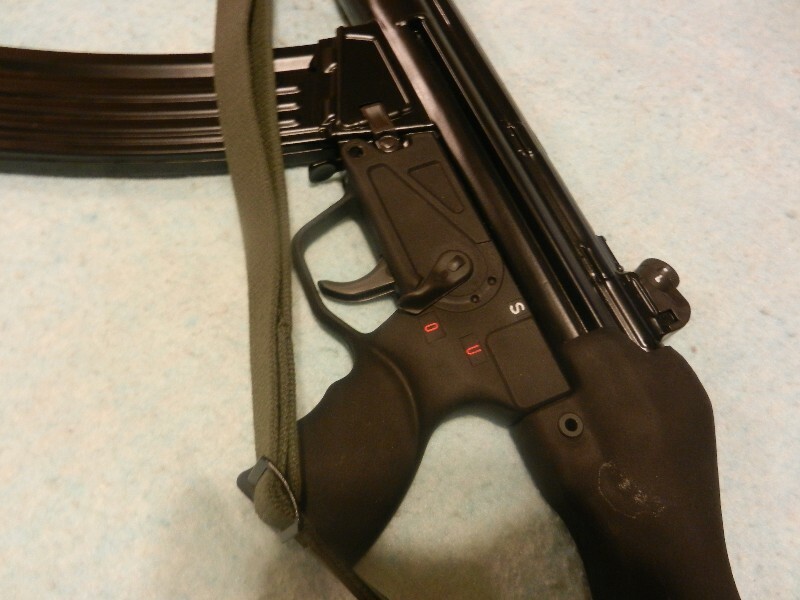 Not surprisingly, MP5A3 is the name given to the version with the 2 position collapsing buttstock. Its worth noting that the MP5 uses a much shorter stock than the G3 and even shorter than the HK33 due in part to its shorter receiver. The A4 and A5 versions are the same as A2 and A3 but with a 4 position selector lever: safe, semi, 3 rd burst, and fully automatic. In 1974, the MP5SD was introduced. The SD was designed to fire standard ammunition suppressed. It has a shorter 5.7" barrel, integrated suppressor made of aluminum, a lightened bolt group, and different handguard style. In 1976, the machinepistol sized MP5K was made available with a shorter 4.5" barrel, shorter handguard with vertical grip, shorter receiver, shorter bolt carrier, and end-cap with sling swivel only. The MP5K was most often marketed with the shorter 15 round magazine once it was available. 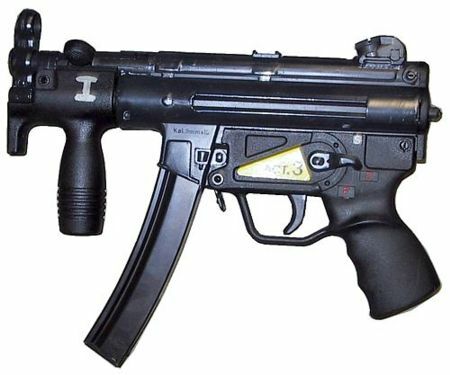 The MP5N was designed per an United States Navy SEALs request. It has a slightly longer barrel with threading for a suppressor, factory night sights, an all polymer lower trigger housing, and additional macho points to make up for the fact an American soldier is firing a 9mm. Finally, in 1991, the MP5PDW was released. The PDW is based on the MP5K, but with a slightly longer barrel with a 3 lug adapter and a side folding polymer buttstock built for H&K by the American company Choate. 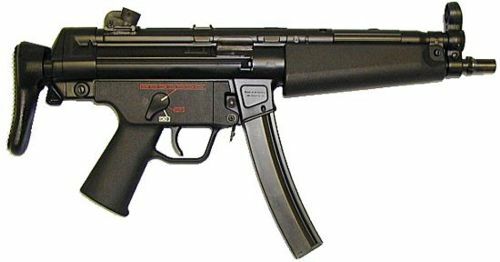 As with the G3 and HK33, H&K also marketed a semi-auto only, civilian legal version of the MP5 in the United States named the HK94. The 94 was similar to the original but had a 16.5" barrel, no 3 lug adapter, and no paddle magazine release lever. Also as with the others, the HK94 was banned from further importation in 1989. Trying to work around the new restrictions, H&K introduced the SP89 pistol the same year. 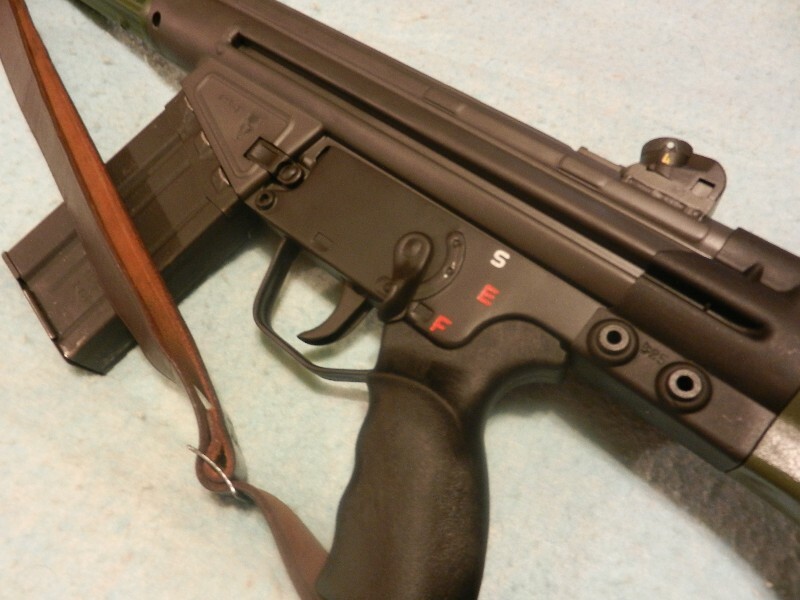 The SP89 was a semi-auto version of the MP5K with a 4.5" barrel and endcap with sling swivel. To comply with US laws, the pistol did not have a vertical foregrip, instead it had a slightly longer handguard. It was also banned from further importation in 1994. The MP5 is the most cloned HK type in the USA. Special Weapons, Bobcat, Coharie, Vector, Velocity Arms, and more have built them from both surplus military parts and newly manufactured US parts. Quality can range from barely acceptable, to as good as an original HK94. One thing all clones seem to share is a pretty high price tag. There is no cheap way to own an MP5 clone. American Tactical Imports (ATI) briefly imported some MP5/HK94 clones built in Turkey by MKE. Three models were brought in: a pistol with a 16" barrel and no handguard or stock, a carbine with a 16" barrel, handguards, buttstock, and pistol grip; and finally an MP5K style pistol with a 4.5" barrel and no handguard. The two pistols could take standard double stack 30 rd MP5 magazines and furniture. The AT94A2 carbine on the other hand, could only accept 10 rd magazines and had a modified rear section and a pistol grip and buttstock group which was welded together. I believe the ATF reversed their decision on the carbine and no more were allowed in after 1 or 2 batches. The pistols both are still legal to import, however, when it came time for a 3rd batch to be imported, ATI and MKE entered into a dispute over pricing. It seems MKE wanted to raise it and ATI did not like the idea much. As a result, no more AT94s have been imported in over a year. This is my AT94, which began life as a pistol. It features a 16" long barrel that is slightly heavier/thicker than that of the HK94. It came from the factory with the paddle style magazine release, which is great; but did not come with a handguard, which was annoying. Now you can find slim MP5 handguards at RTG and HKParts, but when i bought my pistol, they were not available. Finally i found a few at Numrich of all places and ordered 2 sets. I bought an A2 buttstock from RTG, and an A3 collapsing stock from Numrich. Both are POF made, but i returned the A3 stock as i just frankly disliked it. I am a fixed stock guy. I picked up a barrel shroud/faux suppressor from E&L who make a specific version for the AT94's heavier barrel. Its a very nice fake can: lightweight, fits great, and doesn't attach directly to the barrel. Instead it has a screw which presses on a ring inside. So instead of having screws directly pressing onto the barrel, there is a metal ring which squeezes the barrel. I also replaced the MKE lower with an original HK MP5 lower that was clipped and pinned. Its worth noting that the AT94s have a powder coat finish as well. Since mine started life as a pistol, it does take standard magazines. 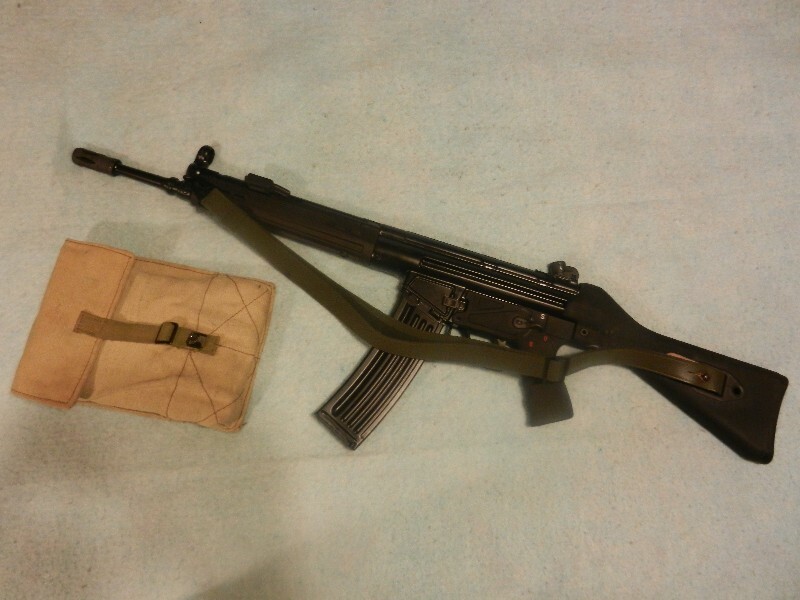 It is pictured with an earlier straight 30 rd magazine and West German magazine pouch. The sling is the original MKE one it shipped with, though I removed the 3 pt section to make it effectively a 2 point sling. Its ok, but I like the sling that is currently on my V93 better. The AT94 is an awesome gun and I hope more will be imported eventually. Think about it, next to a real HK94, this is as good as it gets for a semi-auto only MP5 clone. It is produced in a factory which is licensed by H&K to produce firearms for Turkey's military and police forces. I definitely like that the AT94 has the paddle release from the factory; something the original HK94 did not even have. The only problem with the series is they are not auto-sear ready. There is a block installed in the receiver that does not allow for a full-auto carrier to be used. It was done for importation and I am not sure how easy/hard it would be to remove, but since I am not planning to purchase a registered sear, it does not matter to me a great deal. I just like that this is an imported gun that is well made and above all is very reliable. My gun at least has been 100% reliable with no exceptions. Standard Magazines: 20 rounds steel or aluminium. Standard Magazines: 25 round steel or 40 round aluminum. 30 round steel magazines have been constructed for the HK43/93. MKE in Turkey also manufactures 30 round polymer magazines more recently. Standard Magazines: 30 round straight, or 15 or 30 round arched/curved.